What do you know about the Amsterdam Masterplan? Amsterdam, the Dutch city of 165 canals which would span a combined length of 100 KM (60 miles), contains 1,281 bridges, 2,500 houseboats, and coffee shops where visitors can legally purchase “soft drugs”. Now online gamblers can see the city through the eyes of casino crooks. 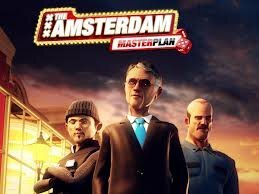 The Amsterdam Masterplan Slot Machine features an exciting theme involving an underground operation to rob a casino. Lucky gamblers that activate Amsterdam Masterplan Bonuses will win Free Spins, Multipliers, and cash payouts. 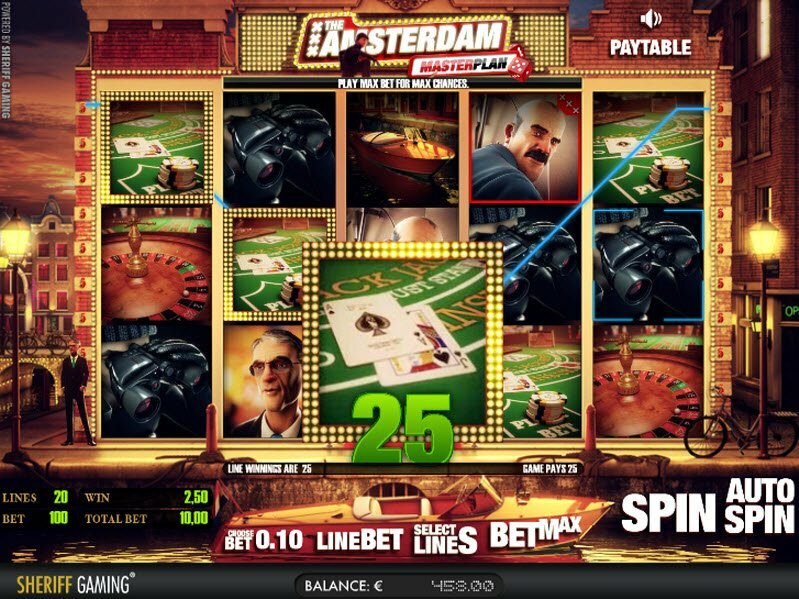 From its slick background music to the sights and sounds of the canal city, play Amsterdam Masterplan Slot for a sophisticated slot in the world of online gambling. Roulette wheels and Blackjack tables all appear on the reels. Keep an eye out for sneaky man lowering down on wires from the ceiling to break into the casino. During gameplay, intriguing and cool music with strong bass lines play in the background. You’ll hear police radio call in implying some sort of covert operation. The sleek 3D graphics and exciting theme create the perfect atmosphere for online gambling. 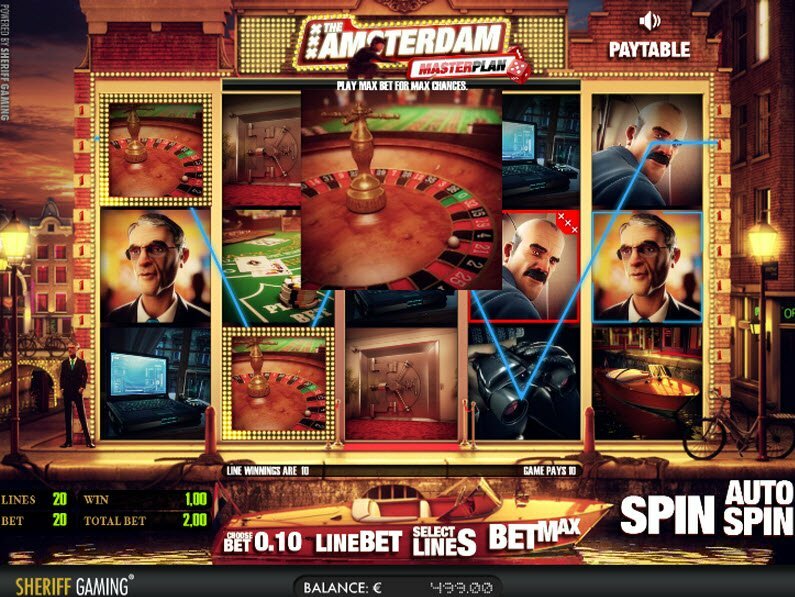 From its slick background music to the sights and sounds of the canal city, the Amsterdam Masterplan Slot brings a sophisticated slot to the world of online gambling. Amsterdam Masterplan Slot Bonuses award lucky players Free Spins, Multipliers, and big cash payouts. For example, when the Spin symbol appears in the center position on the fifth reel, you may spin the Wheel of Fortune. During this Bonus Round, the prize you receive multiplies by the number of active bet lines. During the Extra Cash Bonus, you receive extra cash that the criminals throw at you. In order to enter this rewarding game, players must land on the tech guy, the clever guy, and the inside guy in the exact order. The Free Spins Bonus activates when 3, 4, or 5 of the vault symbols appear on the reels. This Amsterdam Masterplan Slot Bonus rewards 5, 10, or 15 Free Spins respectively depending on how many vault symbols appear.